~ Chinese ideogram for "Tao"
Part One of this column looked at financial/economic issues and at politics and government action for the coming year. On the economic side, I discussed why I see the bears -- and especially the emphatic bears -- as more likely correct than those who expect a mild recession or even a recovery. In the political sphere, the big question is whether the American people will begin moving their nation back, to even the slightest degree, in the direction of liberty. The Ron Paul campaign for president is the barometer here; Paul is focused entirely on restraining government power -- very dramatically, in fact, including ending the income tax, dismantling the IRS itself, and getting the troops out of Iraq and out of every other foreign nation we have military bases in -- over 100 nations and 700 bases. One can only imagine how those in the military-industrial complex see Dr. Paul (although the troops love him; see also here), and every other form of corporatism is threatened as well; for example, Paul talks about ending the "medical-industrial complex" and insists on restoring health freedom to Americans. I see the Paul campaign as a tipping point for the United States : we either begin putting the brakes on our emerging fascist police state, or we go over the edge into the darkness. That sounds unduly dramatic even to me, but then I remember history -- and recent events in this country -- and it sounds all-too-objective. The economic storm that is coming will spur both the forces of government repression/paternalism and the budding freedom movement to greater efforts, making it even more likely that 2008 will be a year to remember in this regard. It should be quite a show. You can see a similar pattern in almost every oil-producing nation. 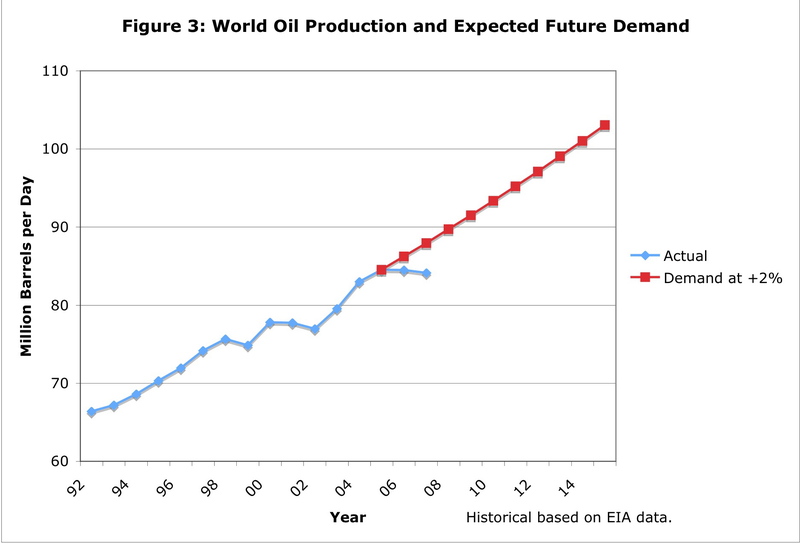 Only a few oil producers have yet to peak and then begin their slide into ever-lower production. Oil may be abiotic or abiogenic in nature (or not) but even if oil fields are slowly being refilled from deep in the Earth as some claim, the refilling process is clearly not happening fast enough to be much of a factor. If it were only one or two nations with inverted-V production curves, I might question the idea of peak oil, but as you can verify here, this is (and has been for decades) the typical path for every oil field, for every oil-producing nation, and for the Earth as a whole -- the planet having already passed the peak oil production point in 2006 according to a widely-reported study by the Energy Watch Group. I have no doubt that we will greatly and rapidly increase our use of solar, wind, and other non-fossil energy resources, but it will not be quickly enough to prevent huge problems. By one estimate, we are already at least 20 years late in beginning mitigation sufficient to prevent major shortfalls in supply. I remember the gasoline shortages of the 1970s (skyrocketing prices, gas stations closed for lack of product, lines of drivers waiting hours for fuel -- and often being limited to five gallons at a time), and I fully expect worse -- much worse -- in the next few years. 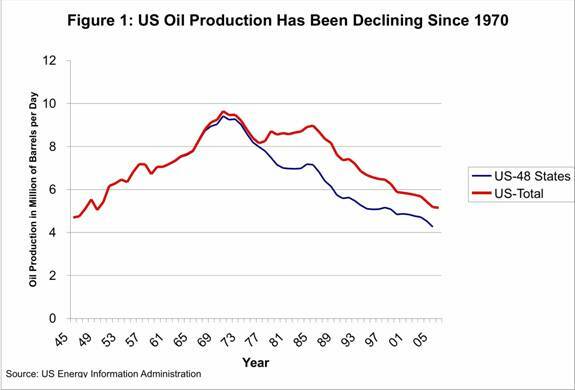 The oil shortfall in 1973 was not a large percentage and America itself produced far more oil than it does today. Yet the disruption was dramatic. Take another look at Dr. Duncan's chart above, and then ask yourself what lies ahead. Given enough time, markets solve most supply/demand problems, and they certainly do a better job at this than coercive central planning, AKA "government." But time is an issue in some cases (thought experiment: you fall out of an airplane without a parachute; will the market save you? ), and we don't have enough time for a seamless fix of many of today's problems even if we did have a truly free market. I'll focus on Peak Oil here, but the same basic points apply to Peak Metals and to environmental damage and to many other issues: If governments weren't wasting trillions of dollars on wars and other nonsense and if they weren't steering oceans of money into pseudo-solutions like ethanol, then the market might be able to solve the diminishing oil supply problem before TEOTWAWKI. We would still have a painful transition period, but we might recover and reach a comfortable equilibrium fairly quickly. But governments are doing what they always do -- making things worse and wasting resources on a massive scale in the process -- so I expect a disaster, by which I mean a long period of serious-becoming-catastrophic disruption, including a spectacular population die-off, before things stabilize. For a detailed look at the supply picture, I can point you to Energyfiles.com, which bills itself as "the world's only B2B comprehensive oil and gas production, consumption and activity forecasting service." The site provides information and forecasts for oil-producing regions and nations around the world. Click a few links at the site and check your favorite oil exporter -- try Mexico [peak year: 2004, with production dropping rapidly now] and Saudi Arabia [peak year forecast for 2018, with a nearly-flat plateau for liquid oil -- gas is also on the graph -- beginning in 2010 or so]. These are America's #2 and #3 suppliers, behind Canada . 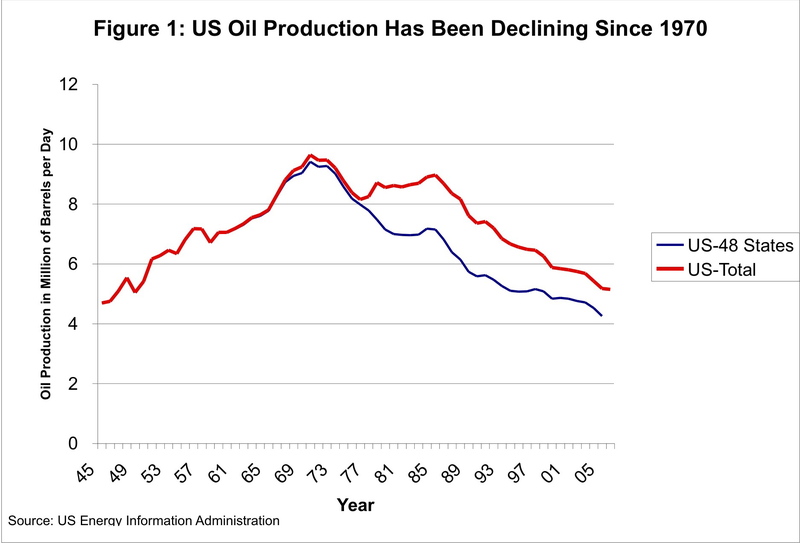 Venezuela , our next largest supplier of oil, passed its peak in 1970, the same year our own oil production peaked in the United States . A final note of irony: Today's high oil prices are creating economic booms in oil exporting nations, leading citizens in those nations to buy more cars and to use more oil in other ways -- leaving less of the production in those nations available for export. Energyfiles.com's site overview by Dr Michael R. Smith includes this: ". . . there is no painless way to fill the gap. Of course it will be filled, partly from traditional sources, partly from new alternatives, partly from simple efficiencies, but a large portion will have to be filled by demand destruction. In the real world demand destruction means poverty and conflict so we should be working towards reducing our vulnerability to such destruction." Readers who are now appropriately terrified may wish to look into the many alternatives to oil, such as nano-powdered metal, which may eventually allow for the continuance of civilization more-or-less as we know it. (Surprisingly enough, powdered metal looks like a serious long-term contender as an energy carrier, especially since it can be de-oxidized and reused. Powdered metal is not something you'll be filling your car's fuel tank with anytime soon, however.) 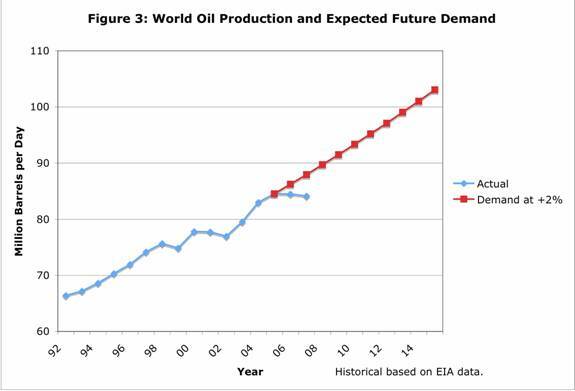 And some believe Peak Oil is a corrupt globalist scam. Others say the peak is probably years away. 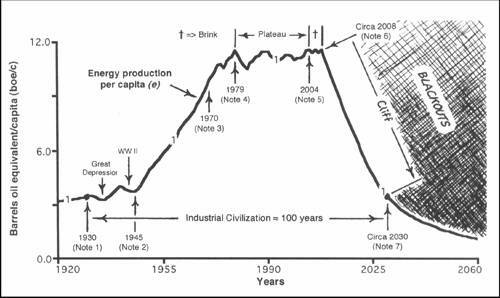 But many experts believe the peak has already occurred, although expensive and energy-intensive replacements for conventional "light, sweet crude" blur the picture, in part because some need a half-barrel or more of oil-energy-equivalent to produce a single barrel of useable oil. Among the more horrifying examples of why government should never be allowed to "set national policy" for anything is the decision in the United States (both at the federal level and, in many cases, by the states as well) to require the use of increasing amounts of ethanol in the nation's fuel supply. Most ethanol in this country is distilled from corn, and -- something the politicians apparently failed to notice -- corn is food. (Also, ethanol from corn and other foodstock does little or nothing to reduce oil usage or pollution -- it may actually require more oil to produce than it displaces and may create more net pollution than simply using gasoline -- and with significantly lower energy content than gasoline, ethanol reduces fuel mileage. For one overview of the concerns about ethanol, see The Backlash Against Biofuels). Even if you never ate a kernel of corn directly, you would be affected by this policy because millions of farm animals are fed corn. Beef, chicken, pork, milk and other dairy products, and of course any food product that includes corn as an ingredient -- from corn syrup to cereal, from tortillas to cornbread -- is now under strong price pressure. With about one-third of America's corn crop now going to ethanol, you'd have to be -- well, maybe an ethanol-industry spokesperson -- to suggest that higher food prices are not due at least in part to this massive redirection of food into the making of fuel. This food-into-fuel disaster is coming at the worst possible time, because other factors are also causing higher food prices, and not only in the United States (see also here and here). In addition to the government-required use of ethanol in America and higher prices for crude oil, food is more costly and scarce due to topsoil erosion and degradation, population growth and dramatic growth of middle-class populations in poorer nations, and drought. Indeed, beyond "mere" drought, a global fresh-water crisis has begun, caused by contamination and depletion of rivers, lakes, and water tables and by increasing use of irrigation for farming, which is draining water tables and large sources of non-replenishable "fossil water" at a rapid pace -- among other factors. Science writer Fred Pierce calls this emerging, global freshwater shortage "the defining crisis of the 21st Century" and -- aside from the various other "defining crises" we face -- I expect he's right. No wonder commentators are saying that "the era of cheap food is over." This will be a nuisance for the rich, but an increasing problem for the middle class -- and a life-and-death issue for the world's poor. In addition to the freshwater crisis and the severe pollution of rivers and lakes (especially in China and the developing world generally), other environmental problems will increasingly intrude on our awareness -- and I'm not talking about global warming, which I believe is over-hyped by (in many cases) people hoping to drum up support for yet more government control of our lives, and hoping for a globe-spanning, one-world-government at that. The carbon footprints and lavish living of the would-be beneficiaries of such schemes at every Important Climate Conference is enough to call participant motives into question; when someone with a private jet, several large SUVs or other vehicles, and a 10,000 square-foot home tells me that I need to sacrifice my lifestyle to save the planet, I can't help being cynical. The Earth may be warming -- or not; some scientists see a severe cooling trend on the way (see also here), and in any case even as the Arctic is warming, Antarctica and other parts of the planet are cooling -- but the Earth is always warming or cooling, sometimes to the point of mile-thick ice-sheets in temperate regions or tropical conditions even in northern latitudes. The "warming/cooling" debate provides another reason to keep government out of such things; in the 1970s and 1980s, global cooling was such a concern that Time Magazine did a feature story on the topic. What I am concerned about is the death of the oceans. We have already farmed out many fish species, bringing their populations to the brink of extinction or even past that point. As the Earth's human population grows and as millions of the poor move into the middle class in China , India , and elsewhere -- and then begin eating more protein, including more fish -- the pressure on the ocean's fish stocks is becoming intense. Pollution from many sources is another reason the fish and coral and other life is dying in our oceans; rivers of untreated industrial and human waste from China and elsewhere; a continent-sized floating garbage dump of discarded plastics which are slowly leaching into the water; and other problems, including some we probably have yet to discover. The other three tipping points: energy, food, and the environment -- are all potentially severe enough to slam into the public's awareness and to spin both public sentiment and government action in ways that cannot be firmly predicted. To the extent that people understand the harm done by coercive government central planning -- many of the largest problems we face are caused in whole or in part by government itself, and solving problems is never a government strong point -- the freedom movement will grow, and we will thus be more likely to respond to events intelligently and to change our responses quickly, if and as necessary. To the extent the public is convinced that only Rudy "freedom is about authority" Giuliani or one of his clones can save us from the various problems (real or otherwise) in life, we are headed for a new Dark Age.